Nothing like a telling graphic to illustrate what most have been expecting, albeit probably not in this order of magnitude. Veteran media exec Alan Mutter discovered some horrid statistics about the state of ad sales for American newspapers on trade organization NAA’s website, and published his view on the Q1 2009 numbers on his blog. They don’t look pretty. The stats show that total newspaper ad sales dropped by an unprecedented 28.28% in the first quarter of 2009, a deep plunge that represents a loss of more than $2.6 billion in ad revenue compared year-over-year. Compared to 3 years ago – 2006 was a pretty good year for American newspapers – we’re looking at a drop of more than $4.5 billion in ad sales in just three years if you only take into account the first quarter. 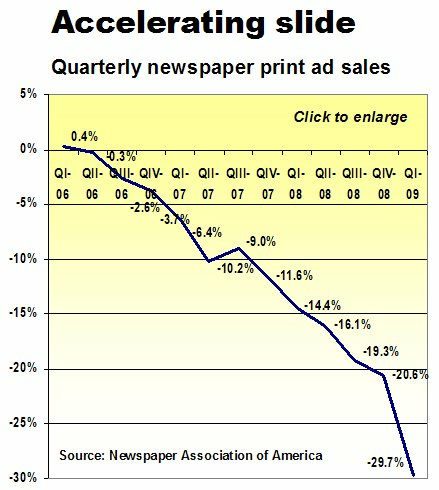 The sharp decline is caused by the lousy state of both digital and dead tree ad sales: the stats posted on the Newspaper Association of America website show that print sales fell by 29.7% in the first three months of this year (to $5.9 billion), while online sales dropped a record 13.4% (to $696.3 million). Classified advertising is clearly still taking major hits. Compared to the first quarter of last year, revenue from all types of classified ads fell 42,32% to less than $1.5 billion. Considering the fact that total classifieds ad sales topped $4 billion back in 2001 and were still at almost $3.4 billion in the first quarter of 2007, that has got to hurt. The biggest losers in classifieds: Recruitment (-67.39%), Real Estate (-45.55%) and Automotive (-43.42%). Annual ad sales for American newspapers came in at a grand total of nearly $49.5 billion in 2005 and dropped to about $37.8 billion in 2008. If the decline rate keeps accelerating the way these first quarter results suggest, we could be looking at somewhere in between $26 billion and $30 billion in total ad sales revenue for this year. And yet somehow, I fear newspapers haven’t even seen the bottom of the barrel yet.